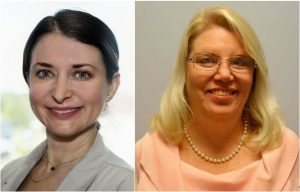 Rainbow Hospice and Palliative Care is proud to recognize two Palliative Care nurse practitioners who received the prestigious DAISY Award. Kate Christopher, ACNP-BC, RN (left) and Pam Tabler, APN, FNP-BC, CHPN (right) are recipients of the DAISY Award for making a difference in the lives of patients. This nationally recognized award celebrates the compassion and skill of extraordinary nurses. Kate Christopher went above and beyond to help one patient in pain and one distressed RN—all during her day off. She effectively collaborated with the nurse, the attending and other consulting physicians to provide the best care possible to the patient. Kate has always demonstrated excellent care towards her patients, specifically by being attentive to what they have to say, and providing compassionate care. Pam Tabler delivered outstanding care to a patient in severe pain and to the patient’s anxious family. She took the time to carefully go through pain management options with the patient and her family. After the care plan was in place, Pam went out of her way to follow up repeatedly even after the patient was discharged. Pam has consistently proven that going the extra mile to deliver exceptional care truly makes a difference. The DAISY Award honors the skillful compassionate care nurses provide and was established by The DAISY Foundation in memory of J. Patrick Barnes. To nominate a nurse for a DAISY Award, please visit www.daisyfoundation.org. We congratulate Kate & Pam and sincerely thank them for their exemplary dedication to the care of patients.